Today was another entertaining and informative show on That Business Show with Jamie Meloni. I spoke first with Becky Fox, owner of Fox Fitness about being a fitness entrepreneur and her journey to running her own business. She spoke of her inspirational moment that came from a simple free training session she had in College that drove her to drop out of her Masters Degree program in Counseling to become a business owner in the fitness industry. 9 years later, Fox Fitness is a successful local business and Becky Fox is available to help you with personal training. Feel free to contact her directly at beckyfox@foxfitness.com or phone at 813-545-8532. Her website has many success stories and more information and can be found at http://www.foxfitness.com. 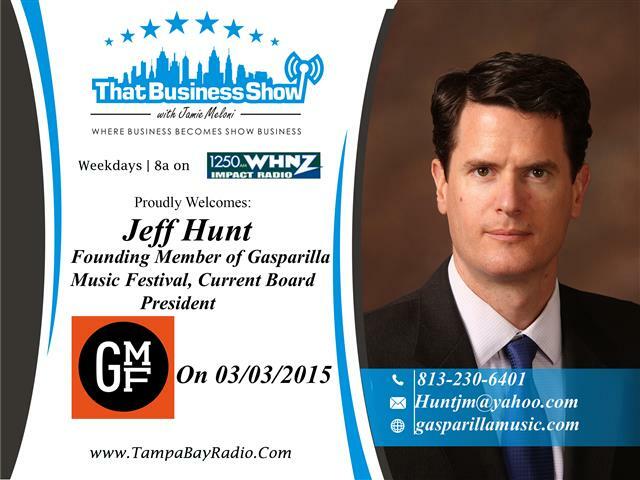 On the 2nd half of the show, I spoke with Jeff Hunt and John Wakefield, founding members of the Gasparilla Music Festival. This is a two day/weekend festival that highlights the aspiring musicians from in and around the Tampa Bay Region and is held March 7th and 8th 2015 at Curtis Hixon Waterfront Park. Jeff and John spoke of their inspiration in creating this music festival as well as gave lots of great information about what participants need to know about the event and ways for both musicians and volunteers to get involved. This is a great family event for children of all ages and you can learn more at http://www.gasparillamusic.com. Act quickly though, tickets are going fast!